Layup? Looked like a dunk to me...it wasn't 100% clean, but it's still a dunk...somebody fire this chick before she calls Ryan Gomes "Ryan Gomez" for the third or fourth time! Yes, I'm keeping track and oh, Kyle Montgomery is THE MAN. 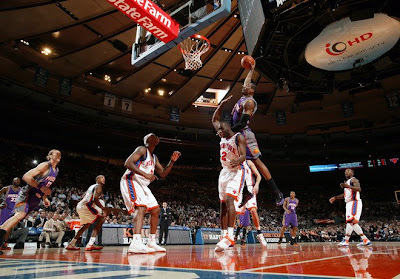 I saved the best for last: Caron Butler posterizing Alonzo Mourning. Tarence Kinsey dunking on Dwight Howard's back wasn't high on the list of things I expected to see tonight when I turned on the Cavs-Magic game. Sorry Zo, I had to do it...MJ posterizes the recently retired Alonzo Mourning. Not as good as his first appearance on You Got Dunked On, but still worth a post. Head nod to LilPharmacist11. and he made it a good one by crushing one on Cheikh Samb. Wilson Chandler posterizing Luis Scola. 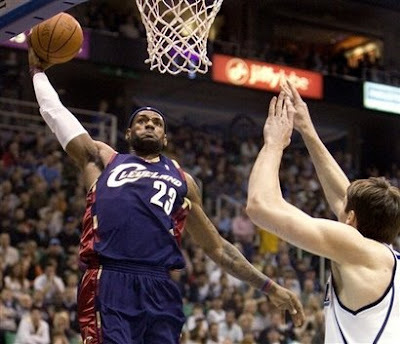 Lebron James with some destruction of Krylo Fesenko.
. That dunk was just plain NASTY. 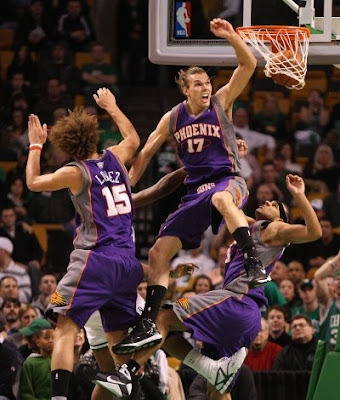 This might have been the best week of dunks yet since I took over this blog. Dunks like this week deserve a poll, so I included the best dunks this week below and I still left out a handful of others that were pretty nasty. 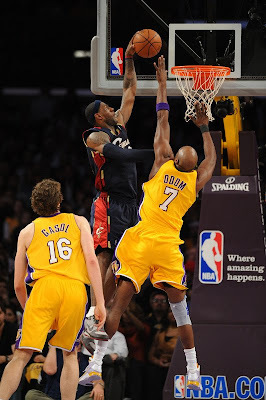 So vote for which dunk you think was the best this. You can click the links to view each dunk. Last Alonzo Mourning video of the day, a young Zo dunks over a young Shaq. 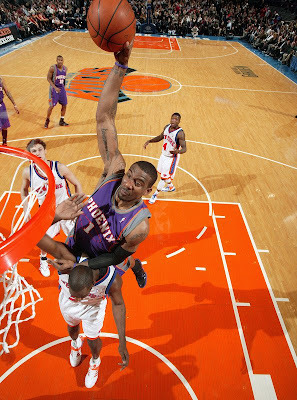 Amare Stoudemire putting Tim Thomas on a screen saver! Clyde The Glide drives past Joe Dumars, throws one down on Bill Laimbeer, and then slams the ball into the ground. 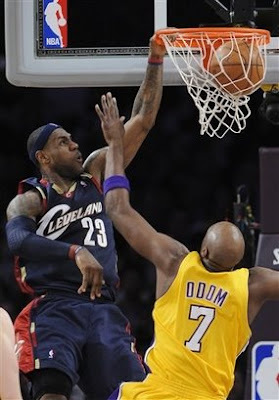 I don't think Lamar Odom knew what hit him after "The King" smashed on 'em. Posterized! Emeka Okafor turning Tim Duncan into Tim DunkedOn. 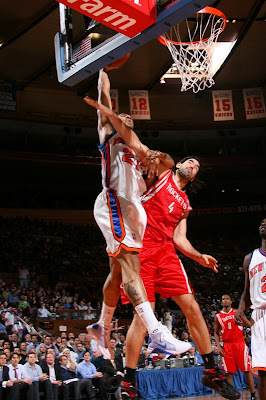 Matt Barnes drives the lane and dunks over Andrea Bargnani. Was trying to rip this one this morning but my video splitter was acting up. Props to LilPharmacist11 for the vid. Wake Forest continues their dunking ways as freshman Al-Farouq Aminu catches the alley oop on Joe Trapani. The Hoyas smashed the 'Cuse tonight and DaJuan Summer smashed on 'em too. Here's an older dunk by Carlos Boozer on KG. for the vid, one of the usual suspects. Update: A big head nod to Flubby over at Kissing Suzy Kolber for tipping me off on where to find a pic of this dunk over at the Card Chronicle. Make sure you check out both spots. The Dunkin' Deacons strike again. This time James Johnson catches the alley oop on Danny Green. Props to 513official2 for the vid once again. 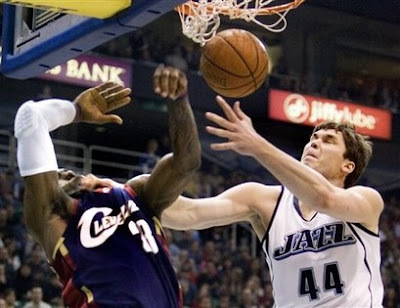 Joey Graham takes it big time to the rack on Delonte West. , someone better tell the freshman to stop trying to take that charge down low. Props to inyoface for the heads up and 513official2 for the rip of the vid. Somebody find me a pic of this dunk ASAP. J.J. Hickson throws down over Perk.